The 2008Q1 GDP release: turning point or inflection point? Real gross domestic product (GDP) edged down 0.1% in the first quarter of 2008, its first quarterly decline since the second quarter of 2003. The economy, which had started to lose momentum in the second half of 2007 as exports declined, stalled in the first quarter due to widespread cutbacks in manufacturing, most notably in motor vehicles. In addition, weather disruptions hampered economic activity in the quarter. Economic output contracted 0.2% in March. Final domestic demand advanced 0.6% in the quarter on the strength of consumer spending. Inventory accumulation eased considerably in the first quarter, after two quarters of large build-ups. The release makes note of three things that appear to be one-off events: bad weather (it was a brutal winter), an auto parts strike, and a rundown in inventories. And since exports have been flat throughout this cycle, I'm not getting too exercised by the slowdown in exports. So there's reason to hope that these last two quarters are an inflection point, and that growth will resume - especially if the US manages to avoid a recession. Employment and real wage growth have been holding up pretty well over the past few months, so maybe this is just another one-off blip. At what point does a sequence of unrelated one-time events become a trend? Analysts in Canada have recently focused less on real GDP and more on nominal GDP, which doesn't adjust for rising prices. That's because even while economic output stagnates, much of Canada's prosperity is coming from the money earned from rising commodity prices. Nominal GDP rose 4.6 per cent at annualized rates in the first quarter, and personal disposable income also surged. Huh? If someone can extract meaning from this, please explain it to me in the comments. The current account surplus with the rest of the world (on a seasonally adjusted basis) increased sharply to $5.6 billion in the first quarter of 2008, led by higher prices for several exported commodities combined with a lower travel deficit. The deficits on commercial services and investment income were largely unchanged. The slow growth in 2007Q4 was largely blamed on a slowdown in net exports. Tomorrow we'll find out what the implications of this rebound are for 2008Q1 GDP. The results of our U.S. fiscal policy simulations show that the expiration of the tax relief from the AMT and the expiration of the tax cuts enacted in 2001 and 2003 can impose short-run economic costs to the U.S. economy. However, in the long run, aggregate demand in the United States and the rest of the world benefits from the expiration of AMT relief and the 2001 and 2003 tax cuts, owing mainly to a corresponding fall in the world real interest rate. Furthermore, the simulations highlight the potentially important role that U.S. fiscal policy adjustment can play in the unwinding of global current account imbalances. In particular, the increase in taxes associated with the expiration of relief from the AMT relief and the expiration of the 2001 and 2003 tax cuts can result in an improvement in the U.S. current account deficit. Nevertheless, this improvement is small compared with the size of the adjustment required to reverse global current account imbalances: U.S. fiscal policy is only one factor behind such imbalances, and will therefore be only part of a successful adjustment package. Memo to the US Democratic Party from the rest of the world: Please get your act together and win the election. Thank you. The good: In addition to being good policy, there's some reason to be optimistic that the Liberals' carbon tax proposal will be good politics. According to one poll, more than 60% of Canadians approve of the general idea of carbon taxes. And even noted environmentalist David Suzuki endorses the idea. David Suzuki can't always be counted on to support sensible policies, but at least this time he's not going to be an obstacle. The bad: As predicted, the Conservatives are spinning the carbon tax as, well, a tax. And since the CPC is unable to distinguish between smart and stupid taxes, they're coming up with stuff like this. The ugly: The NDP's response is a confusing jumble of faulty analysis and short-sighted pandering. Layton raises carbon tax alarm: NDP Leader Jack Layton launched a vehement campaign against carbon taxes yesterday and was quickly accused of alarmist pandering by prominent Canadian environmentalists. Speaking to a fundraiser for an Ottawa homeless shelter, Mr. Layton said carbon taxes would raise home heating costs and hurt Canadians living on the margins. He said big corporations should bear the lion's share of Canada's climate-change tab and a federal ombudsman should ensure those costs aren't passed on to consumers. "With energy costs soaring in Canada, we've got to ensure that the solutions to climate change don't aggravate an already dire situation for those who struggle to make ends meet," Mr. Layton said. He said he supports a cap-and-trade system, which imposes penalties on industrial emissions above a certain level, or cap. Liberals, meanwhile, are preparing to announce a plan built around carbon taxes, which is expected to apply to a wider range of emissions and raise money for environmental efforts. He said big corporations should bear the lion's share of Canada's climate-change tab and a federal ombudsman should ensure those costs aren't passed on to consumers. It is at this point that one begins to despair of the NDP. Premier Dalton McGuinty says Ontario will give General Motors more money for new projects, despite thousands of layoffs announced by the automaker. GM wants the Ontario and federal governments to contribute about $140 million towards a new engine plant in St. Catharines, Ont., and a new research centre in Oshawa. GM has received about $250 million in provincial money, and recently announced layoffs of 1,400 workers in Windsor and about 900 in Oshawa. But McGuinty says Ontario is still competing with U.S. states to land new automotive projects and must be prepared to pony up some cash. Why do governments still think that they can win this game? Liberals say carbon tax will be revenue-neutral: [I]nternal policy discussions are still underway and a number of proposals are under consideration. One proposal under study would replace the federal fuel excise tax - which applies to gasoline and diesel used for vehicles - with a more broadly based "environmental tax" to include other fuels such as natural gas, heating oil and coal-generated electricity. That plan, proposed by economist Jack Mintz and Nancy Olewiler of the Sustainable Prosperity Institute, would leave the existing excise tax of 10 cents per litre of gasoline and four cents per litre of diesel unchanged. The authors estimate that applying the excise tax to other fuels would increase tax revenue by between $12 billion and $15 billion annually. The revenue could be used to substantially lower personal and business taxes and to fund tax credits related to climate change technologies. If the Liberals follow through on this, they will have the distinction of being the only major party that has a sensible position on reducing greenhouse gas emissions: the Conservatives are unable to distinguish between smart and stupid taxes, and the NDP is busy pandering to those who think that gasoline prices are already too high (h/t to Paul Wells). [Liberal finance critic John] McCallum said the Liberals are working out a plan where tax credits or some other mechanism will be necessary to ensure pensioners and other Canadians with fixed incomes, low wages or who are otherwise in zero or low tax brackets must also receive compensation. "You may be sure that we would be acutely aware of people who have lower incomes or more difficult times and you could be certain we will do everything to look after those people," McCallum said. "Some of the lower-income people don't pay tax, so that would be a feature of any such program if we were to have one." I don't know how it happened, but the Liberal Party of Canada has found a way to be relevant again. There have been any number of MSM stories based on StatsCan's recent release on earnings and income. 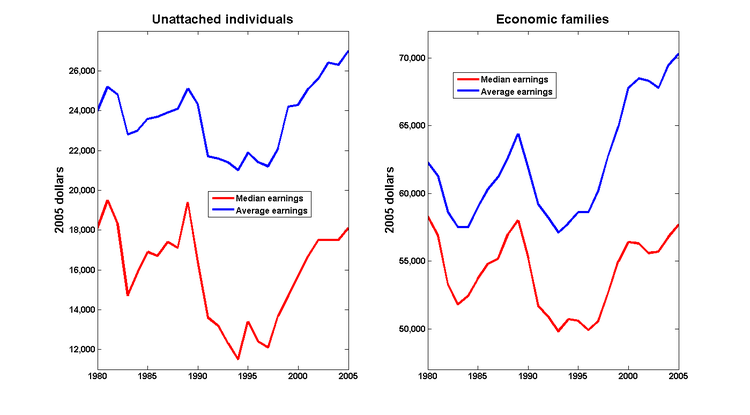 Median earnings from market income for individuals in 2005 are pretty much the same as they were back in 1980, and market income inequality has - by any measure - increased over the past 25 years. Although median market income in 2005 was the same as it was in 1980, it hasn't remained constant: the recessions of 1983 and especially 1991 reduced real median incomes considerably, and it's taken ten years to recover. And the widening gap between the average and the median indicates increasing inequality during this time; something we knew about already (see this post, and this one, among others). Inequality in market income doesn't bother me much in itself; what really matters is inequality in income after taxes and transfers. 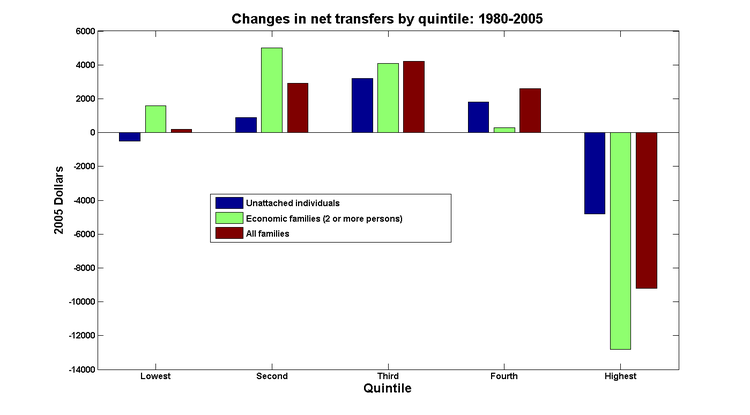 If policy-makers are responding to rising inequality by improving its programs for redistributing income, then the effect on inequality of disposable income will be a wash.
Net transfers to the highest quintile have decreased; income growth has been concentrated at the top end of the income distribution, so their tax payments have grown in proportion. But the main beneficiaries are not those with the lowest incomes; the increase in net transfers has been concentrated on the middle income groups. 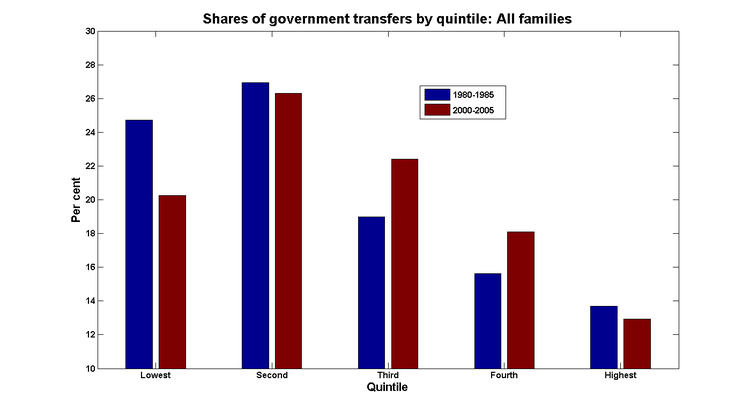 The share of transfers to the lowest quintile has decreased since 1980, as has - albeit to a lesser extent - that of the second quintile. The winners in this reallocation are the middle and fourth income quintiles. It's not hard to imagine an explanation for this; the median income group is likely to include the median voter. So every political party will be happy to sacrifice the lowest income group's interests (that group is either taken for granted or written off entirely) in order to gain popularity at the centre.